John Maynard Keynes is probably the most influential economist in currently-practiced economic policy. Among the Keynesian marks left on economics is the idea of the necessity of government intervention to moderate the booms and busts of the economy. As the theory goes, governments must spend during a recession to stimulate the economy. This idea makes a lot of sense if you’re hearing it for the first time. When you’re tired, coffee helps you get back to normal, and similarly, if the economy is down, you need to kickstart it with some spending to get the ball rolling again. Economics is the government deciding whether to increase its spending when there’s a recession, and if it’s worth going into debt. 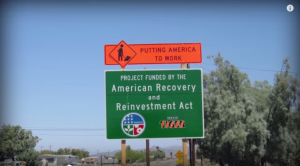 Usually the answer is yes, increase spending, as the United States did with its $831 billion Stimulus Package (also known as the American Recovery and Reinvestment Act of 2009). The problem with testing economic theories is that you never know if it actually works. The 2009 Stimulus Package did not have the kickstarting effect that was predicted; the free-market economists said that this was because Keynes’s theory is wrong and government spending does not help the economy because a stimulus package would only take money from the more efficient private sector economy (through taxation) and transfer it to a less productive public sector economy. 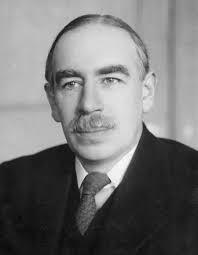 However, Keynes supporters argue that Keynes is correct and the Stimulus Package did work, and the situation would have been much worse if the government had not intervened. Unfortunately, we’ll never know the truth empirically, since economics is not a physical science where you can have an identical “control group” economy to compare it to. And while Adriene’s point didn’t directly claim Keynes’s theory to be true, she did imply it. By presenting the downside of spending as “going into debt,” which isn’t necessarily true, she doesn’t mention what real dissenters of stimulus spending would argue: that stimulus packages are a net negative for the economy, even if the country doesn’t have to borrow money to pay for it. 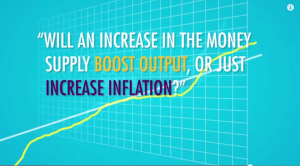 Will an increase in the money supply boost output, or just increase inflation? Framing the question this way essentially presupposes that increasing the money supply can boost output, but the risk is that it may also increase inflation. This is also derived from Keynes’s theory of government intervention for a recessed economy: increasing the money supply (i.e. creating money and buying financial products with them) will give more money to banks who then lend out that money to people for long-term capital projects (building construction, investing in companies, etc.). Now there’s more money circulating in the economy as more people get to borrow money to fund their projects, and the financial industry is booming because they are the first ones to get the newly-printed money. However, printing money runs the risk of prices increasing as the dollar becomes less valuable. The Keynesian theory describes money creation as a balancing act; the government needs to print just enough to kickstart the economy, but not too much to create an inflation problem. Again, real dissenters from Keynesian economic theory (or at least those who follow the Austrian Business Cycle) would argue that increased inflation is not the only risk of increasing the money supply. As the Austrian theory goes, money printing distorts the economy, shifting production from consumer goods (like stuff you buy at CVS) to capital goods (projects that banks give big loans to). The shift is harmless at first and may even appear to boost the economy, however, this distortion that provokes an artificial boom will ultimately result in an even greater bust. In other words, the cups of coffee you drank to wake you up will leave you with a bigger caffeine withdrawal the next day. With these two examples, it’s not too hard to see a preference toward Keynesian macroeconomics, but who can blame them? Keynesianism is widely-practiced in countries around the world and is supported by many economists. The least they can do, however, is correctly present the real concerns about Keynesian policies, and not the Keynesian concerns about Keynesian policies. Next Next post: Why Didn’t Economists Predict the 2008 Financial Crisis?